Archana has upped the glam quotient this year and given us loads of inspiration to not only rock during Diwali, but also over wedding season. Whether you are out and about with the family, getting married or perhaps you are part of the bridal party, this Indian festive season is all about comfort and understated elegance. First and foremost, let’s set the mood this Indian festive season with a beautiful contemporary white and gold lehenga from none other than Masaba Gupta. The white and gold lehenga combination is fast becoming a popular choice for brides to be. White is associated with innocence and purity, so break away from the norm and embrace the unconventional look for your mehendi or sangeet party. Our festivities are packed full of colour and whilst it might seem unusual to rock a white and gold lehenga for your wedding, this timeless look will no doubt turn heads over the festive season. Designer, Masaba is well known for combining modern, structured aesthetics with traditional patterns. Her new collections are lightweight and sophisticated and will take you all the way from daytime to night festivities. The crepe and organza lehenga with chanderi dupatta and delicate white sequin-embroidered blouse will have you rocking the tradional avatar with flair. We absolutely love how Archana has styled the lehenga choli with a striking pearl choker set from Esfir Jewels. Makeup is kept to a minimum with defined eyeliner and blush cheeks and lips and natural curls for the locks. Add a twist to your festive look, by taking cues from the stars. We’ve seen it on Anushka in Bollywood hit movie, ‘Ae Dil Hai Mushkil’, on the runways and more recently on Bollywood celebs, Kajol and Alia during celebrity outings. Yes, it’s the classic white shirt. This timeless, wardrobe staple is now a hot item for brides to be. With or without accessories, this lehenga-blouse ensemble adds a semi-luxe style to your engagement, outdoor mehendi party or any pre-wedding party. The look can be carried off with subtle makeup and loose hair, striking the perfect balance, where east meets west. We often turn to the stars for inspiration and we can see how quickly this trend has caught on with even the fashion bloggers. Archana has achieved a glamorous yet stylish look, which you can sport with a simple maxi skirt or heavily embellished silk brocade lehenga. If you want to add a touch of sartorial elegance to your look this Indian festive season, then this is the ideal fusion look to have you standing out at any function. Archana has accessorized the blouse with a statement kundan rani haar neckpiece for added drama and regalness. For the more traditionally minded maharani, the stunning lehenga can also be paired with a matching off-shoulder crop top in the same emerald green tone. Once again, makeup is kept neutral here, but on this occasion, a hint of metallic green eyeshadow is used to elevate the entire look. We don’t know about you but the anarkali outfit is always a winner during the Indian festive season. 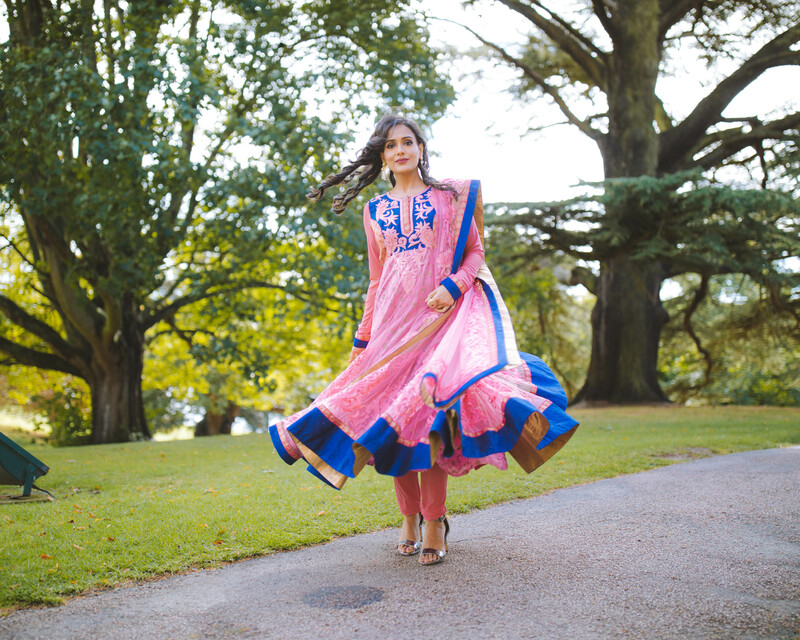 A versatile outfit, the anarkali has a flattering silhouette that can work for any occasion. It’s flowy and light and have we mentioned how easy it is to wear too! Archana has struck the right balance here by opting for a vibrant, festive colour combination. 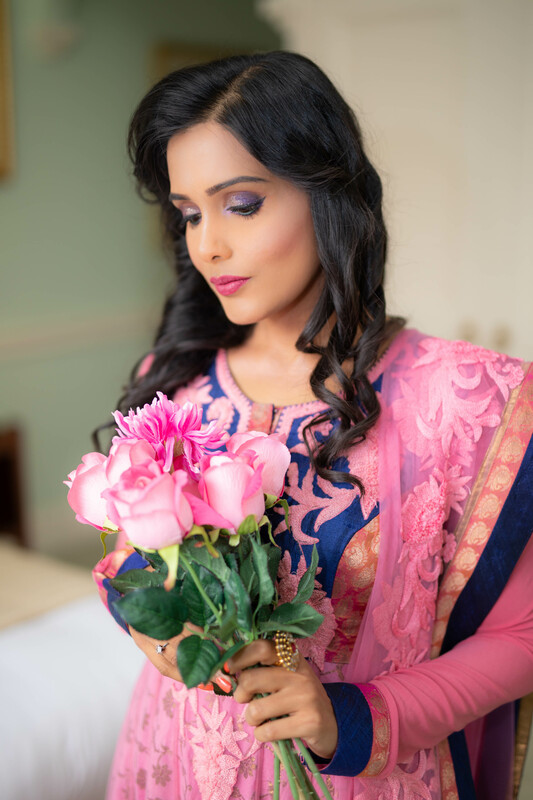 The royal blue and romantic pink colour is a great match for any pre-wedding party or occasion. You can opt for bright and beautiful without going overboard. Here we see colour blocking done right and it’s refreshing. Once again makeup is minimal with just a slight hint of light blue shimmer on the eyelids and soft pink lips. The key to selecting an outfit this Indian festive season is to opt for unique and timeless ensembles that are traditional yet trendy but also reflect you! Whatever your style or look, switch it up and make sure that you stand out at every occasion. 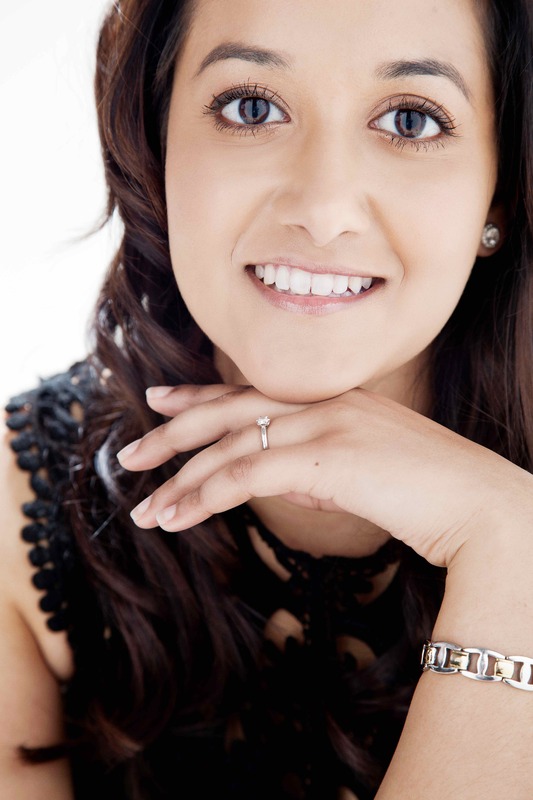 Big thanks to Archana for sharing her glamorous self with our audience. We hope to see more of you in the future. Hope we have given you plenty of inspiration to amp up your style for the Indian festive season. Would love to know where you are shopping this year and how will you be styling your outfits. Let us know in the comments below! Also don’t forget to join our new and exclusive Facebook group dedicated to Indian brides to be. We’re inviting South Asian brides from all over the world to join in the discussions about all things wedding related.